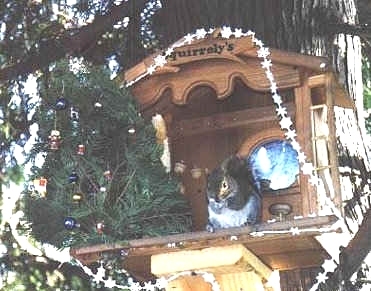 This is one of the Douglas Squirrels at Squirrely's Bar standing by the Christmas tree. She is directing all the squirrels that are on the ground in a Christmas carol. Rudolph the Brown Nose Squirrel I think is the name of the tune they're singing. They're not as quite as good as the chipmunks but it's the thought that counts. Due to the present situation in Iraq, I will not be doing a story on Monica Squirrelenski this week so I can bring you the latest news on our armed squirrel forces. They have been preparing to be shipped to the Persian Gulf. The Flying Squirrels (Airforce) are preparing their planes and getting ready to drop a smart missile nut on top of Saddam in attempt to make him a bit smarter. They figure that hitting him on top of the head with a nut may knock some sense into him. 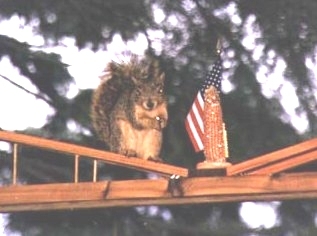 The Squirrel Seals (Navy) are going to pound him with surface to air nut missles. These nut missles fly in a horizonal pattern so don't bend over Saddam. The A.S.T.D (Armored Squirrel Tank Division) has a new surprise for him this time, it's the surface to air corn cobs, with night vision capabilities. The I.S. 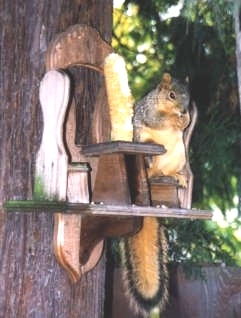 (Infantry Squirrels) are also busy cleaning there sunflower seed guns in preparation of a ground assault. And if all else fails we're going to send Monica Squirrelenski over there as Saddam's personal weapons inspector as she knows where to look. You have all heard the phrase, being out on a limb. This is W.C. looking down at Monica Squirrelenski wondering how to shut her up. She has ruined his reputation with some of the local squirrels and the other half is wishing they had squirrel aides. The western gray squirrels seem to be plotting to get him removed from the Brownhouse while the Douglas squirrels are standing behind him smiling. So stay tuned same place and same time next week for the continuing story on Monica Squirrelenski. 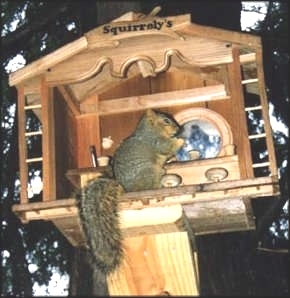 This is a picture of the first squirrel feeder I built about four or five years ago. They spend hours sitting in the chairs and having their fill of corn. It’s fun to smear peanut butter on the empty corn cob, they love it. 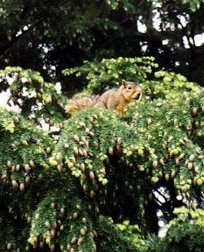 The squirrels are really plentiful these days. It’s not uncommon to see three to five at a time. They are so busy stuffing their bellies and hiding nuts they haven’t had much time to fight with each other. Yesterday there were two squirrels in the bar and one on top of it. It was a good day for the squirrel bar business. It’s also the time of year when there fur coats are the prettiest and their tails are the bushiest. Judging by their size, they are ready for a long winter.